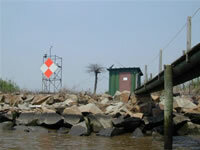 LOCATION.--Lat 39`30'03", long 75`34'07", New Castle County, Delaware, Hydrologic Unit 02040205, on dock on streamward side of jetty about 0.4 mi downstream from Reedy Island near Port Penn. PERIOD OF RECORD.--Water year 1997 to current year. PERIOD OF DAILY RECORD.-- SPECIFIC CONDUCTANCE: October 1963 to current year. pH: February 1970 to current year. WATER TEMPERATURE: February 1970 to current year. DISSOLVED OXYGEN: February 1970 to current year. INSTRUMENTATION.--Water-quality monitor since February 1970. Probes interfaced with a data collection platform since 1986. Probes placed in situ since July 1998. COOPERATION.--Funding for the operation of this station is provided by the Delaware River Basin Commission and the U.S. Geological Survey.